had a great day at the lanes today. I watched as the oiled just before league, and decided on my Hybrid. the Hybrid has the most friction, even in oil. And, gets a stronger roll. I normally would have tried my reactive cover, but decided to take a step down, thinking I could move up if I needed to. So, while others were figuring out the oil, I just rolled strike after strike. 31 strikes in 36 balls rolled. 255, 261, 266 for 782. Wow!! Haha, still got my 3 splits and one cherry. this was way too easy on this very easy house shot. Just bank the ball on the 8 board at 45 feet. After today, I'm averaging 226 for the Summer, which is about 30 over my regular average. I didn't improve, I am practicing reading lanes and adjusting to them. Some days, it works, others not. Today, it did. It's the old, take what the lanes will give you. haha, we all are about the same age, except for Mark. Thanks, this reminded me that I never fixed my age on my profile after my birthday. Mark, I think I have shoes older then you. Bowling or regular? I have my late grandfather's old two hole bowling ball (pre 1960, it was before Brunswick changed name from the Brunswick Balke Collender to just Brunswick). I also have two old pairs of his shoes and his old Elks Lodge bowling team shirt. I've always appreciated the history of bowling and I really don't want to see it fade away, although things still look bleak based on how often I hear about centers closing around the country. When I first got my grandfather's old ball, I wanted to get a vintage pin on ebay to go along with it. It turned into a collecting hobby, the attached picture is from my Game Room. They range from all wood pins from the 1940's (best estimate from research) to the present. I figured members here might like to see them. Way to go Dennis, Even if it was an easy shot you had to be consistent. I could use that house shot to boost my confidence after having a couple of terrible weeks. Interesting talk. I don't let the ball dictate how I drill it. If the ball's dynamics are radically different then my delivery or speed allows, I don't get it. I'm very comfortable with a symmetrical core, RG of 2.58 an Diff of .032. Then, the only difference is the cover stock, that I can manage. I see so many people with vastly different balls. Different cores, Differentials, yet, they release all the same way. I've seen snapping asymmetricals roll out because of a release. And, low arcing balls hook like mad for the same reason. Lessen your variables and you may have better results. I carry 4 balls and each rolls differently. But, only because of the covers. I actually have the same core in 3 of 4. But, one is solid, another pearl and the 3rd is a hybrid cover. Most of the balls I have are drilled for my current release and perform fairly well. My one asymmetrical in the bag performs better if I go back to lower tilt release. Only found this out in the last couple of leagues. I am using my summer league to vary my release and see how it affects each ball. As for your preference of balls thinking very seriously of ordering the L/M The Buzz Legend RG 2.55 and diff .31 in 16lbs. I have been looking at low diff balls and ran across this one on closeout for $65 from California Bowling.I have the Buzz PE in 15 which is basically the same ball maybe a little difference in cover both being hybrids. There are also some 15lb balls for $35. Thanks Boss. this shot just shows me how bowlers can get a false sense of accomplishment and average, as well. I've been a believer that the lane condition does in fact, control your game. And, this shot shows it. And, you have seen how honor scores have radically grown in numbers. Remember when the USBC proposed the Red, White and Blue oil patterns to indicate their degree of expertise? Well, if the White was the easiest, this would be below that, IMO. I have a friend in this house who has tracked all of his scores since 1998. He has 198 300 games, and over 30 800 series. Yet, he refuses to bowl in league as it is too tough. He bowls 5 games about 3 times per week. We used to bowl daily at 9 am with about 12 others, until the house started to shorten hours and open later. It's down to just him and I only see him occasionally. I also have a chart produced by my Assotiation. It includes the 11 houses in the assn. It shows the 300 games at each house bowled ev year for each house since 1986. The first year, there were 4 rolled at ALL houses. By 2010, the average was over 80 for each with a couple having over 125 300's. Improving ball technology and standardization of oil patterns to a shorter pattern with dry outside have attributed to this. A few houses have reverted to tougher patterns, attracting better bowlers and competitive leagues. Then, there are a couple who have gone the cosmic bowling route. I don't see the two existing simultaneously. If nothing else, you should have enjoyed your day at the lanes. It takes a lot to shoot 700+. Watching the guys who average over 220 even on a THS takes some decent bowling. One of the guys from our men's league who averaged over 220 I think this past year and bowls three or four nights a week at various houses bowled in the PBA tournament at Parkside. He didn't do very well with a 186 average for his 8-games. Back in '08, I think, there was an old guy who just sat in the back of the bowling alley. Everyone knew him and he was always congenial. Well, I shot a 300. And, a few weeks later, he gave me a bowling pin from the rack, that he mounted on a hand made base with a back plaque, that had the date and location on it. He passed a couple weeks later. And, I relished that he gave that to me. I now know who I will leave that to in my will. Hope, you're not in any hurry. djp, 2 friends finished 46 and 71. Both out of the money. 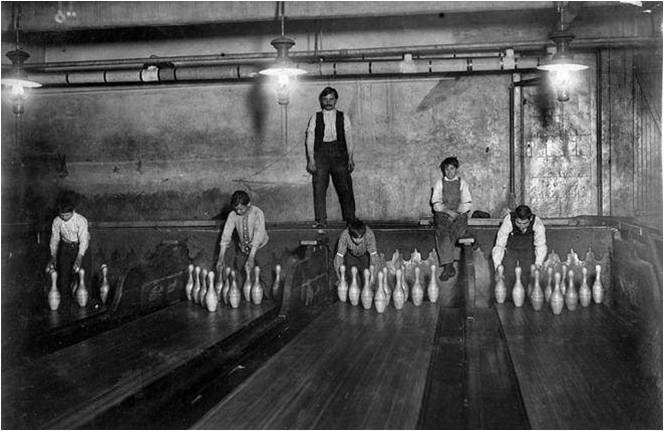 There just isn't a lot of money to be made in bowling, any more. Only 5 made $2000 or more. Another friend entered, but couldn't take off from work to go. Generated in 0.022 seconds in which 0.004 seconds were spent on a total of 16 queries. Zlib compression enabled.